Over the years there have been a number of feature articles about our work.Our warm thanks is extended to the publishers for their permission to publish them here. EMAILS WE HAVE ENJOYED - a remarkably small belfast sink. 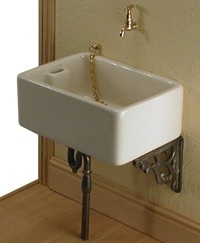 height by 52mm width, and very attractive total price of £30 for the sink, brackets and plumbing kit. you think for my trouble warning you of these errors, you can offer me the whole package at £30, I would be pleased to purchase one immediately. Otherwise, good luck with your enterprise'.